It isn’t without a reason that our elders kept egging us on to take care of our tresses-be it by regularly oiling of the scalp or by using precious herbs to embalm and treat the roots. There has always been such care and premium attached to our tresses being an asset. In the hurly burly of everyday life, we opt for a practical plait or a prim ponytail to keep our hair out of reckoning, focusing only on convenience and manageability. It just takes one special occasion to send us scurrying for help. What if you have to wear a silk saree to a conference, or a very special person’s birthday, a wedding or a staff dinner-in fact there are so many formal occasions that demand wearing of silk sarees and one truly has to work on how to team it up with the right hairstyle and accessories. Heaviness of the silk saree-could be light tussar to very heavy kanjeevaram-so the requirement could differ. The length of the hair-of course-after all -that is the main ingredient! The duration of the outing. Weather condition and location of venue-outdoors would mean wearing loose hair will end up tangled and an event indoors could leave options more fluid. Silk sarees lend an air of grandeur to your look instantly. The vibrant colors, the sheen of the texture, and the inevitable presence of resham and zari, evoke a more traditional look. 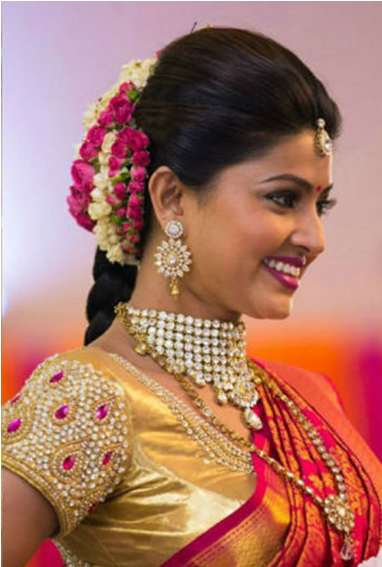 If it’s a heavy Uppada, Kanjeevaram, Silk Gadwal , Baluchari, Pochampally or Paithani-do opt for hairstyles that show a certain heaviness around the crown of the head or near the upper portion of the head. This helps in balancing the look. 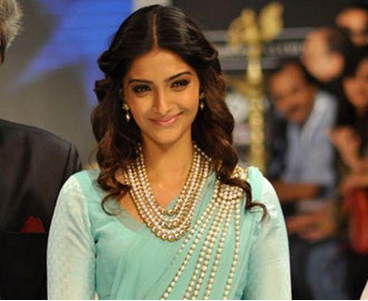 The bulkiness that heavy silks sarees can add to one’s look can be addressed by such a hairstyle. This needs a few hair puffs to place under swept up and swept back hair. This is one style that immediately adds the look of stately dignity to hair, giving volume to the look while at the same time creating an impression of a bouffant. One can wear flowers as shown or add hair accessories like diamante pins and clips. It looks fabulous with long chandelier earrings and temple jewelry. Pulling off this great style is this gorgeous diva, who likes to play the traditional card with her hair, every once in a while. She as a tousled heap of strands, that have been bunched at the back, and then converted to a side French plait. 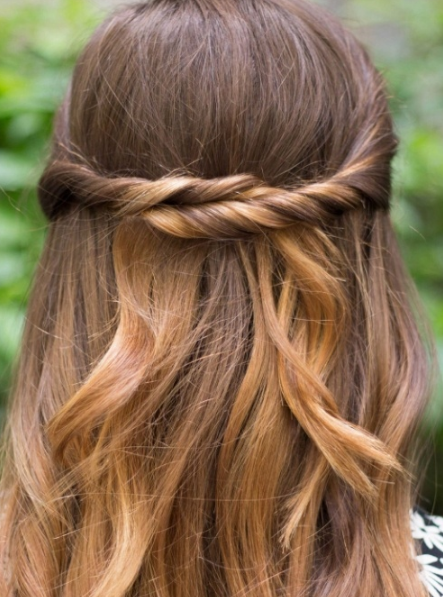 Please note the manner in which a strand of hair finishes the last bunching at the base of the braid. Do remember to blow dry your hair to create the right kind of wispiness on top and add temporary glow glitters to the top strands for the colour effect. I wouldn’t mind adding a floral touch to the braid if it were a marriage one has to attend. Sometimes it is the simplicity of the hairstyle that offsets the perfection of the saree. It is vitally important that unruly and curly hair be kept a little more confined while wearing a traditional silk, as it makes the appearance a little more elegant. If the saree is too heavy and the hair is all askew it can play havoc with your confidence. Try hiking up the hair, creating a false bun with the help of a puff and then use the rest of the hair for making a simple braid. Those who like their hair to be open must ensure heavy conditioning before venturing into this hairstyle. Also pay attention to what you would use to secure the tresses in a classy manner. Go for this style that takes your waves back over the nape, leaving the face clear, though you could have a few curly tendrils. Secure it a little high with a diamante clip. Make sure that you are indoors for this style to last you all through the evening. This style is most suited for those hair that is wavy and smooth, Avoidable if you have curls and very thick hair. Perfect for a long haul wedding-this is one of those styles that can never fade away with time. The multiple braids allow your hair to show off its glorious thickness while the possibility of adding hair ornaments too is tremendous. Works wonders with girls with medium length hair as well, as the bun itself could be made with extensions. 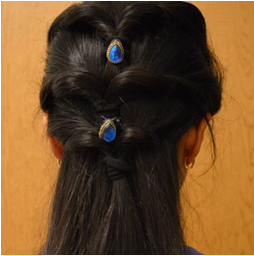 Wear glittery threads braided into the strands or simply used pearl pins along the sides for that bejeweled look. Well there is a solution for slightly curly hair in the form of this combination look, wherein the upper portion of the hair is pulled softly back for an updo and the rest of the hair is made into a soft looking bun by simply taking the natural curls and pinning it. .The bun sits right above the nape of the neck. You could give a trim of fresh jasmine flowers to get the look going! 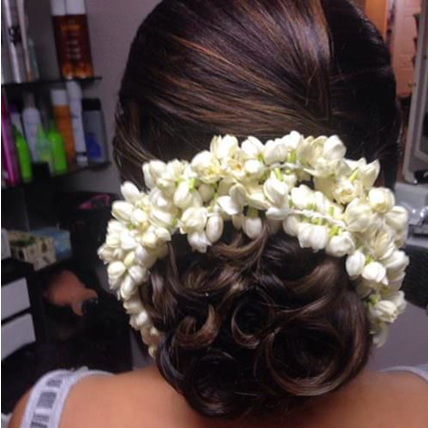 This style surely is for those who hate to keep their hair confined with pins and ornaments. Perfect for those special dinners when you will mostly be indoors. There is of course a need to have your hair tweaked and styled slightly with curlers and set well with a spray. The center parting allows the hair to fall like natural sheath on both sides of the face. To make it look different, you may pin it back slightly, but the loose hair around the face softens the look of formality and makes the features look wonderful. Great style for medium length wavy hair, albeit after some amount of blow drying. With a saree, you can never go wrong with your dressing, and with these wonderful hair styles especially picked for those who love their silks-there could not have been a better combination to achieve drop dead gorgeous looks.